Snoop Dogg is undoubtedly one of hip-hop’s greatest pioneers. A godfather of gangsta rap, he has continually evolved over his 20+ year career, and crossed over to the mainstream like no other rapper before or since. His partnership with superstar producer Pharrell Williams in the early 2000’s generated some of his biggest hits, such as 2004’s “Drop It Like It’s Hot”. The song “Beautiful” was released in January of 2003 as the second single for his sixth studio album, Paid tha Cost to Be da Bo$$. The song was produced by the duo The Neptunes, which Pharrell is a member of, and features Charlie Wilson and Pharrell singing on the hook. 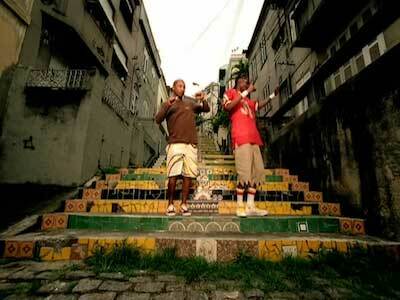 Snoop and Pharrell hanging out on the Escadaria steps in Rio de Janeiro. The song is a departure from Snoop’s previous hits, with a more smooth R&B tone than his gangsta rap past. This allows Snoop to infuse the R&B genre with his laid back flow, and for Pharrell’s silky smooth vocals on the hook to shine. This is an earworm of a song, as it will be stuck in your head for days after listening to it. Lyrically, it’s a tale of a guy trying to court a beautiful woman, which is standard stuff. However, Snoop makes the subject matter his own with a style and swagger only he possesses. Snoop wears a pair of natural (unbleached) white high top chucks in the video. 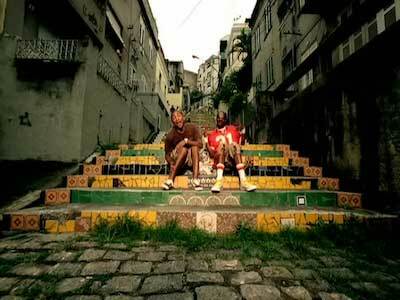 The music video takes place in Rio de Janeiro, Brazil, specifically the Escadaria Selarón, Lapa district. 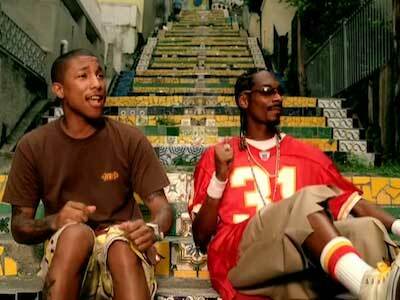 Snoop and Pharrell spend most of the music video sitting in front of a Brazil-colored yellow-green-blue stairway, where Snoop rocks a Kansas City Chiefs jersey, and natural (unbleached) white high top chucks with yellow laces. They make their way through the city with a group of girls to the Copacabana beach, and see the sights and sounds of Rio along the way. The video ends with Snoop conducting a group of Brazilian drummers under the Rio moon as the song fades out. It’s a different setting from what we’re used to seeing in Snoop’s video’s, as most of his video catalog has taken place in his hometown of Long Beach or fit in with the “gangsta rap” style. However, this video is just a fun display of a couple of guys enjoying life with some beautiful women. Snoop and Pharrell enjoying Rio and life. If you have information about specific videos where chucks make an appearance, please contact us at mail@chucksconnection.com. Get yourself a new pair of chucks to court in by clicking on the links below.